Pizza Hut is introducing a vegan pizza to its menu this January in 253 Pizza Hut Restaurants across the UK. Whilst many high-street restaurants such as Pizza Express and Zizzi have been quick to embrace veganism by introducing vegan pizzas to the menu, chains like Pizza Hut have been slower to offer customers the option of dairy and meat-free pizzas, although the company recently gave customers the option to opt for vegan cheese on pizzas purchased in their restaurants. 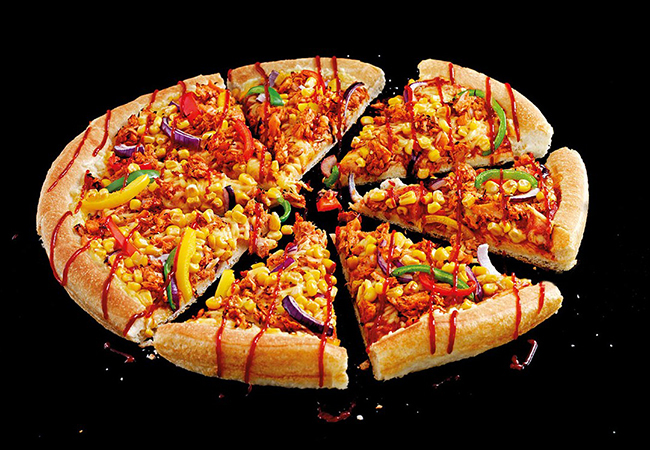 The Vegan ‘Jack ‘n’ Ch**se’ Pizza (priced from £11.20) features a tomato base with Violife’s award-winning non-diary cheese alternative, sweetcorn, red onions, peppers and BBQ Jackfruit with a BBQ drizzle. The new Pizza is available from the 1st January, for one month only, but the company plans to make the jackfruit pizza a permanent menu item if sales exceed 10,000 units during Veganuary 2019. The new addition, which is available across Pizza Hut Restaurants 253 Huts gives customers the option to choose from 15 vegan toppings and three vegan bases – Pan, All American Thin and Gluten Free bases. Pizza Hut Restaurants will also be running a #IWantYouJack competition, offering guests the chance to win a £100 gift card if they post a picture of their vegan pizza and follow @PizzaHutUK on Instagram.